Researching and applying for student loans can at times be challenging and confusing. Often, one of the more difficult aspects of the process can be identifying and securing a cosigner for your loan, someone who is legally responsible to repay a loan if for whatever reason you cannot. If you can’t qualify for a loan in your own name for the full amount needed, applying with a creditworthy cosigner may help you qualify for a lower interest rate. Though most students use their parents as cosigners, this is not an option for some students for a variety of reasons. If enlisting a parent is not an option, you may still have someone in your life who may be willing and may qualify to be your cosigner. We’ve assembled the following tips to help you find a cosigner for your student loan. First, let’s consider the requirements to become a cosigner so you can better understand who is eligible to potentially support you. Let’s consider the Ascent Tuition Cosigned Loan for a moment. 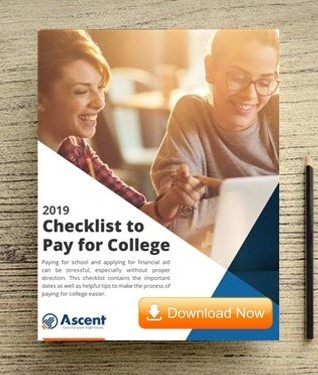 As we explain in the Ascent Frequently Asked Questions, there are specific requirements to qualify as a cosigner for an Ascent Tuition Cosigned Loan. Have a minimum gross annual income of $24,000. Meet a monthly debt-to-income (DTI) ratio. Submit proof-of-income and be continuously employed for the past 2years. Have a minimum FICO® score of 680 as determined by Ascent Student Loan. Have defaulted on any private or government student loan. Have any delinquencies of sixty (60) or more days during the previous twenty-four (24) months. Have reported bankruptcy within the past five (5) years. Have any unsatisfied repossessions, judgments, tax liens, foreclosures or garnishments by creditors. Have any settled or unpaid non-medical charge-offs or collection accounts that exceed $100 in total. Have any settled or unpaid medical charge-offs or collection accounts that exceed $500 in total. Your cosigner should be someone who meets the eligibility requirements discussed above, and genuinely believes in you. They’re someone who wants to support your future and is ready to cheer you on throughout your path to graduation. Cosigners can be parents, guardians or other relatives such as aunts and uncles, however it’s not required that they be related to you. If you have a close friend or mentor whom you can reach out to, you can ask them if they’d be open to being your cosigner. You should subsequently share the eligibility requirements, as well as other details about your loan. Remember that asking for help is a sign of strength—don’t be afraid to reach out when you need it! 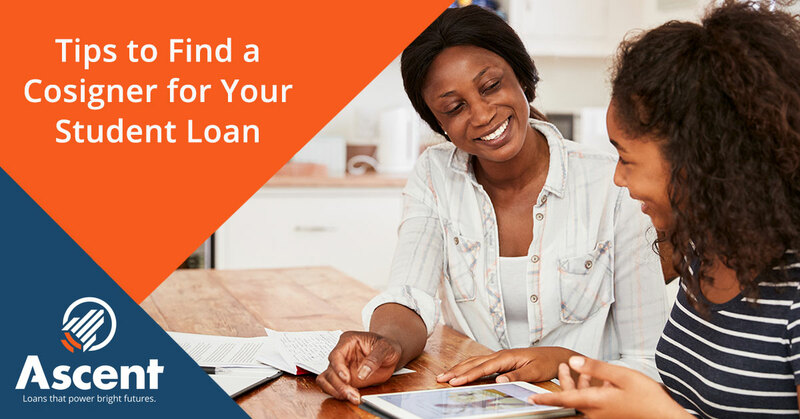 When asking a friend or relative to be a cosigner, it’s important to show them that you’re serious about succeeding with your education and that you understand what it means to have a student loan. Remind them that Ascent incorporates financial education the application process to help you borrow responsibly. This way, they’ll be more confident that you will make the most of their assistance, including making payments on-time. After all, they are responsible if you fail to make your student loan payments. Their credit history can also be affected by missed payments. Communicate with them that you’re serious about being responsible for your payments and that you understand the risks they are taking on. One of the benefits of the Ascent Tuition Cosigned Loan is the ability to release your cosigner after certain conditions are met. This means that once you apply to release your cosigner, you’ll take on full responsibility for your loan and your cosigner will no longer be on the hook for missed payments. Releasing your cosigner is a great way to take on financial responsibility as well as build your credit score. Finding a cosigner may be easier if you communicate that you can release them from their responsibilities after making the first 24 consecutive payments on-time and in full, in addition to meeting the program requirements for a solo student borrower. These requirements include being a U.S. citizen or having permanent U.S. resident status and setting up automatic debit payments. Once you’ve released your cosigner, you’ll have a greater sense of independence and financial freedom. If you have exhausted all your options for a cosigner and cannot qualify on your own, you may want to consider applying for a different type of student loan. Ascent Independent is an innovative non-cosigned loan designed with students in mind. Eligible Juniors, Seniors and Graduate Students may qualify based on their future earning potential, satisfactory academic progress and credit history (see qualifying requirements). Wherever your college dreams may lead you, we’re here to support you. We have a variety of resources available to serve you on your journey and we’re here to answer any questions you may have. Check out our blog for more tips.